Leib Salzman (Lejb Zalcman), better known by his adopted name Leib Malach, was born November 27, 1894 in Zwoleń, Radom Gubernia. He moved as a teenager to Warsaw and worked at a variety of odd jobs there. Taken under the wing of the Yiddishist writer H.D. Nomberg, his writing began appearing in the Warsaw press. He left Poland in 1922, settling and writing for the most part in Argentina, but traveled the world posting dispatches from his travels in the Yiddish press. 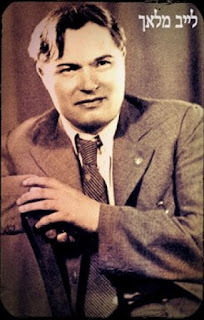 He died suddenly after an operation in Paris on June 18, 1936. 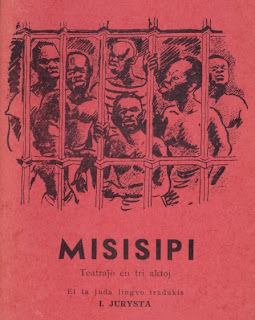 "Malach's final and most performed play was Mississippi (cover of Esperanto translation shown here), which dealt with the 1931 Scottsboro trial. The play was written for Mikhl Weichert's Yung Teater in Warsaw, known for staging contemporary events like the trial of Sacco and Vanzetti." In honor of Leib Malach’s most famous play, Mississippi, written in the immediate aftermath of the Scottsboro trial, listen to a song from Phil Ochs, written 30 years after the play’s Warsaw production. Here, Ochs brings the theme of justice denied in Mississippi up to 1965. "Amol, Amol" (Once, Once)”: The cover of Malach’s epic poem "Amol, Amol," published in Warsaw, shortly before his emigration. Malach was a successful writer in a number of different genres. From Spain to Holland: One of Malach’s many travel dispatches, this posthumously-published 1937 book describes Spain on the brink of civil war, fascist Germany, the leftist resistance in Vienna, and other travels throughout Western Europe. Incidentally, the punchline to Phil Ochs' "Here's to the State of Misssippi" is "Mississippi find yourself another country to be part of." Kazohinia reviewed in English in 1948! Le Monde diplomatique en Esperanto - la "Diplo"